Midfielder Aeron Edwards says The New Saints are targeting another domestic Welsh treble and remain unbeaten all season. 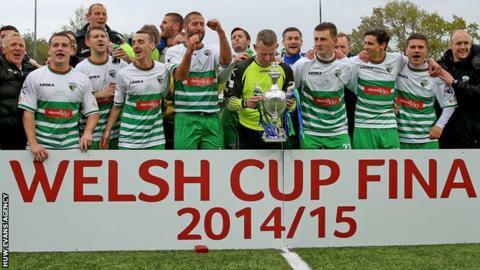 They secured the Welsh Premier title for a ninth time in 2014-15 and also won the Welsh Cup and Word League Cup. The Oswestry-based side lost only once last season and Edwards, 27, says they want to go one better this campaign. "We've got to work hard and it will be more challenging this season," he said. "It's hard to top that because we've won everything. Maybe we can go unbeaten, that's all we can do really." Saints begin the defence of their title away to newly promoted Haverfordwest County on Saturday, 22 August. Craig Harrison's side, whose only defeat was against mid Wales rivals Newtown, finished 18 points clear of second placed Bala Town last season. Edwards says he expects their main rivals this season to be Gap Connah's Quay, whose summer recruits have included striker Les Davies from Bangor City. "They've invested quite heavily of what I've heard and brought some good players in," Edwards added. "I think they will be up there this year." Saints reached this season's Champions League second qualifying round, beaten 2-1 on aggregate by Hungarian side Videoton. Edwards says the aim will be to retain the Welsh Premier League title in order to progress further in the Champions League next season. "We won a round in Europe and got so close in the second round and it's getting that step closer," Edwards said. "It's fine margins and hopefully next season it will be us that goes through." The first match of the new season sees Rhyl host Bangor City on Friday, 21 August.